KUALA LUMPUR: With the separation of TA Enterprise Bhd’s stockbroking and property businesses, Datuk Tony Tiah Thee Kian will be sitting on what will be among the top five property companies in the country in terms of market capitalisation. “My strategy is to have a consistent source of income for the group in good times and bad times,” he said in an interview yesterday. TA Global Bhd, which will house the property business, will be listed in November. The separation of the property and stockbroking business was conceptualised several years ago. “The timing is perfect. The landbank is there, acquired over the years at very good prices. Our assets abroad are iconic,” Tiah said. Tiah said he was now making an appearance because he was executive chairman of TA Global. “I have to put forth my vision, my strategy and my future plans to the shareholders,” he said. The listing is expected to create a bit of excitement for various reasons. First, this marks Tiah’s return to the business world after a hiatus of several years. “It is interesting because suddenly, he is back and heading one of the top five property counters in the country,” an analyst said. Secondly, the Tiahs have made successful forays beyond Malaysian shores, with hotel and commercial properties in Singapore, Australia and Canada. All of these are income generating. Tiah is quick to add that his “active service for now” will culminate with his children taking charge one day. Tiah, with his 37 years in the business world, will provide the vision and the strategy. Tiah has a masters degree in business management with speciality in finance and corporate and investment management. 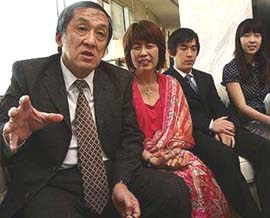 His son, Joo Kim, has been with TA Enterprise 22 months. His daughter Sook Lin joined the company a few months ago. Another daughter sits on the board of their Canadian property management company. Tiah and his wife, Datin Alicia Tiah, built up one of the biggest stockbroking businesses in the 1990s. Today they also built up shareholders’ funds of nearly RM2bil. Despite his absence from the corporate scene for some years, Tiah was nevertheless involved in the company’s acquisitions. “The listing of our property arm is a very strategic move. I want to put this company on solid rock. The strategy is to have part of our income coming from property investment, which is consistent. We will have the income from our local projects as well as those from abroad. “Even in recession, the hospitality industry will continue to provide a yield. And the car parks portion of commercial projects which we are going to develop here will be a cash cow. We will also not be selling the podium section of our commercial developments in and around Kuala Lumpur,” he said. Tiah said there had been a lot of questions on why TA Enterprise wanted to invest in these assets as the general feeling was that the yield was not high. But he said the yield was consistent in good and bad times. “We gain in terms of yield. As for our overseas projects, we have to think of our currency versus the foreign currency,” he said. TA Global will have projects with total gross development value (GDV) of between RM6bil and RM7bil in Malaysia. The company also owns two hotels in Australia, a hotel in British Columbia and a business centre in Canada. It recently bought a hotel in Singapore. On home turf, it is planning to build two hotels in Kuala Lumpur, one fronting the Petronas Twin Towers and another in Jalan Imbi area. Tiah said TA Enterprise would not be selling its stockbroking business. “Our origins were stockbroking. Whether we seek investment bank (IB) status depends on the financial climate. There are too few projects around at this time. To be an IB, you need intellectual manpower and this is costly. So for the time being, we will defer this. We no longer aspire to be the biggest in this area,” he said. SYDNEY: Australian housing and construction data on Wednesday added to evidence of economic recovery that spurred the central bank to raise interest rates on Tuesday, Oct 6 and is expected to bring more tightening in months ahead, says Reuters. Demand for investment-related home loans and construction finance jumped in August, government data showed. A separate industry survey showed a pickup in overall construction last month, helped by a revival in demand for housing, ending 18 months of contraction. That boded well for third-quarter economic growth and backed views that the Reserve Bank of Australia (RBA) would keep lifting interest rates in coming months from "emergency" low levels. "Overall, this adds to the litany of other hard economic evidence that the recovery is well and truly emerging and there is absolutely nothing in this report to dissuade the RBA from lifting the cash rate again in November," said David de Garis, senior economist at National Australia Bank. The Reserve Bank of Australia became the first central bank in the Group of 20 to raise rates since financial markets crashed in the aftermath of the collapse of Lehman Brothers' more than a year ago. It notched up its cash rate by 25 basis points to 3.25 percent and kept the door open for more as it judged that the economy had weathered the worst of the global financial crisis. Implied rates, based on money market and swap rates, are pricing in a 77 percent chance of a quarter percentage point rate rise next month. Over the next 12 months, 166 basis points of rate increases are being priced in. In its economic assessment on Tuesday, the central bank said house prices and housing credit were both growing at a solid pace. That echoed concerns voiced earlier by central bankers who said keeping rates too low for too long could give rise to a housing bubble. The solid demand for homes in the past year has been attributed to strong population growth and 50-year-low mortgage rates. Unlike the United States and Britain, where house prices have fallen in the midst of the financial and economic crisis, Australian house prices have held up remarkably well, rising 4.2 percent in March-June. Investors flocked back into the housing market, which accounted for 27 percent of all loans issued in August. Investment lending surged 7.6 percent from the month before, owing to an increase in commitments for the purchase of dwellings for rent or resale. Overall construction finance for building new dwellings to owner-occupiers rose 4.6 percent from the month before and jumped 69 percent from August 2008. Only demand from first-time home buyers showed signs of slackening, as the stimulatory effects from generous government grants began fade. The percentage of first-home owners fell in August, but still remained high at nearly a quarter of all loans. Demand for home loans fell 0.6 percent, compared with forecasts for a 1.0 percent drop but the decline was much smaller than a contraction of 2.2 percent in July. Analysts expect the paring back of the grant, which was halved at the end of September, coupled with the likelihood of further rate increases to temper the appetite for housing finance, especially from first home buyers, in the months ahead. "We suspect that the RBA will be pleased to see an easing in appetite for housing finance, particularly from first home owners," said Su-Lin Ong, senior economist at RBC Capital. She expects the cash rate to go up to 4.50 percent by mid- 2010. Still, analysts believe that pent-up demand for housing and strong population growth will support a housing construction boom from late 2009 and will be a key growth engine through 2010. A survey of 200 firms by Australia Industry Group and the Housing Industry Association, showed the main measure of overall construction activity climbed 8.4 points to 50.8, finally putting it back above the 50 threshold between growth and contraction for the first time since February last year.